Sun., Oct. 2, 2016, 8:26 p.m.
CHASKA, Minn. – This wasn’t about being maybe the best team ever assembled. 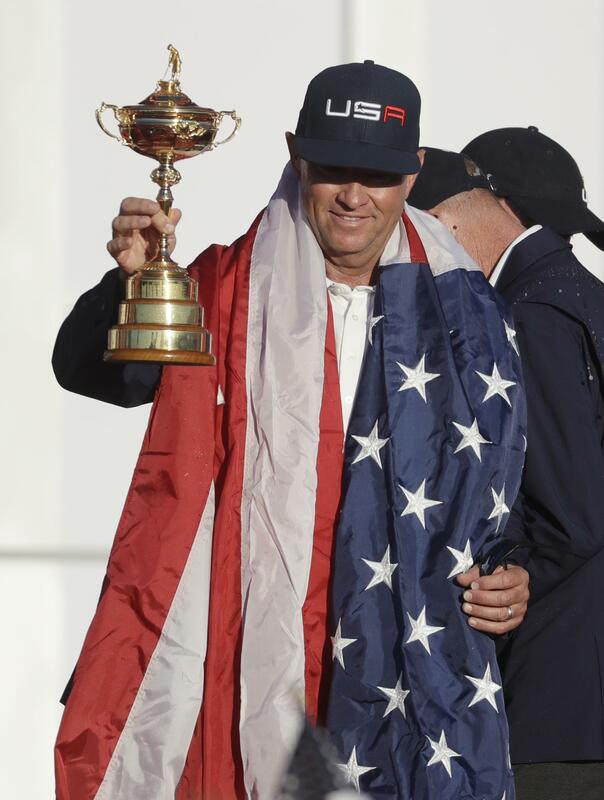 The Americans were simply a team, and they finally won back the Ryder Cup. Phil Mickelson led the Americans behind the scenes. Patrick Reed powered them with his passion on the golf course. And it was Ryan Moore, the final captain’s pick who wasn’t even on the team until a week ago Sunday, who delivered the cup-clinching point at Hazeltine. Moore finished eagle-birdie-par for a 1-up victory over Lee Westwood, and the celebration was on. There was no meltdown like Medinah four years ago, when the Americans blew a 10-6 lead under captain Davis Love III. Europe never really had a chance. Reed outdueled and outshouted Rory McIlroy for a 1-up victory, and by then the back end of the scoreboard was filled with American red. Ultimately, this wasn’t about measuring against the past as much as it was building to the future. The Americans lost for the third straight time in 2014 at Gleneagles, and it was team divided over everything from how the captain was selected to how the team should be built. Mickelson put his image on the line by publicly challenging captain Tom Watson at the closing press conference in Scotland, and he was the strongest voice among five players on a task force that was assembled to figure out why the Americans couldn’t seem to win. Mickelson was under pressure all week and delivered 2 1/2 points, including a halve with Sergio Garcia in which both birdied the final two holes. The golf was equally great. Reed faced the tallest order in the leadoff match with Rory McIlroy, and the quality of golf was as high as it gets. Reed squared the match by driving the fifth green to 8 feet for eagle, and he kept the tee until the 18th. Reed matched McIlroy’s birdie on No. 6, McIlroy matched Reed’s birdie on No. 7 and the par-3 eighth hole was as sensational as it gets in a Ryder Cup. McIlroy holed a 60-foot birdie putt, leapt into the air and cupped his hand to his ear, mocking the American crowd to yell even louder. Reed then holed a birdie putt from 35 feet, charging the crowd before turning to wag his finger at McIlroy. They bumped fists and patted each other on the back, both 5 under through eight holes. Their standard of gold dipped after that, perhaps because they spent so much energy pumping fists, and Reed finally took his first lead when McIlroy bogeyed the 12th hole. McIlroy’s putter went cold, and Reed closed him out with a 7-foot birdie on the 18th. Mickelson made 10 birdies, and Garcia made nine birdies against no bogeys in their match. Among the lone bright spots for Europe was Thomas Pieters, the Belgian rookie who had the best debut of any European rookie by going 4-1. He took down J.B. Holmes in the third match, right after Henrik Stenson dismantled Jordan Spieth. By then, it was ominous. There would be no comeback like Medinah. There would be no celebrating for Europe, which it had done eight of the last 10 times. The Americans stood atop a bridge to the left of the 18th green and sprayed champagne on themselves and the crowd, an enormous gathering that sent endless cheers of “U-S-A” and “Red, white, blue” across Hazeltine for three straight days. Every U.S. player contributed a point. For Europe, Westwood was among four players who ended the week without a point. The Ryder Cup Task Force was dismantled after Love was named captain for the second time, though Mickelson and Tiger Woods remain on a committee for the next Ryder Cup in 2018 in France. Europe has not lost consecutive Ryder Cups since 1993. Published: Oct. 2, 2016, 8:26 p.m.